Indicate the number of shares outstanding of each of the issuer’s classes of common stock, as of the latest practicable date: 14,900,000 shares of common stock outstanding as of August 12, 2011. Nova Lifestyle, Inc. (“Nova Lifestyle”), formerly known as Stevens Resources, Inc. was incorporated in the State of Nevada on September 9, 2009. Effective as of June 27, 2011, in anticipation of the Share Exchange Agreement and related transactions described below, the company changed its name from Stevens Resources, Inc. to Nova Lifestyle, Inc. through a merger with its wholly owned, non-operating subsidiary established solely to change its name pursuant to Nevada law. Concurrently with this action, Nova Lifestyle authorized a 5-for-1 forward split of its common stock effective June 27, 2011. Prior to the forward split, Nova Lifestyle had 2,596,000 shares of its common stock outstanding, and, after giving effect to the forward split, it had 12,980,000 shares of its common stock outstanding. The effect of the stock split has been retroactively restated. On June 30, 2011, Nova Lifestyle entered into and consummated a series of agreements that resulted in the acquisition of all of the ordinary shares of Nova Furniture Limited (“Nova Furniture” or “Nova Furniture BVI”), a corporation organized under the laws of the British Virgin Islands (“BVI”). Pursuant to the terms of a Share Exchange Agreement and Plan of Reorganization dated June 30, 2011 (the “Share Exchange Agreement”), Nova Lifestyle issued 11,920,000 shares of its common stock to the four designee shareholders of Nova Furniture BVI in exchange for their 10,000 ordinary shares of Nova Furniture BVI, consisting of all of its issued and outstanding capital stock. Concurrently with the Share Exchange Agreement and as a condition thereof, Nova Lifestyle entered into an agreement with its former president and director, pursuant to which he returned 10,000,000 shares of Nova Lifestyle’s common stock to Nova Lifestyle for cancelation in exchange for $80,000. The $80,000 was a 90-day note bearing interest at 0.46% per annum payable to the former shareholder. Upon completion of the foregoing transactions, Nova Lifestyle had 14,900,000 shares of its common stock issued and outstanding. For accounting purposes, the transaction is being accounted for as a recapitalization of Nova Furniture BVI because Nova Furniture BVI’s shareholders own the majority of Nova Lifestyle’s outstanding common stock and exercise significant influence over the operating and financial policies of the consolidated entity and Nova Lifestyle was a non-operating shell prior to the acquisition. Pursuant to Securities and Exchange Commission (“SEC”) rules, the merger or acquisition of a private operating company into a non-operating public shell with nominal net assets is considered a capital transaction in substance, rather than a business combination. Nova Furniture BVI was incorporated under the laws of the BVI on April 29, 2003, and primarily is engaged in investment in China. On June 6, 2003 Nova Furniture BVI formed Nova Furniture (Dongguan) Co., Ltd (“Nova Dongguan”) as a wholly foreign owned enterprise incorporated in the Guangdong Province of the People’s Republic of China (“China” or the “PRC”) and primarily engaged in the development, manufacture and sale of furniture. Effective March 8, 2005, the controlling shareholders of Nova Furniture BVI formed Nova Furniture Holdings Limited (“Nova Holdings BVI”) under the laws of the BVI and transferred all of their equity interest in Nova Furniture BVI to Nova Holdings BVI. This transaction was accounted for as a reorganization of entities under common control, with assets and liabilities transferred at their carrying amounts, and the financial statements are presented as if the reorganization had occurred retroactively. On May 20, 2006, Nova Holdings BVI formed Nova Furniture Macao Commercial Offshore Limited (“Nova Macao”) under the laws of Macao. Nova Macao mainly is engaged in furniture trading with products purchased and imported from Nova Dongguan. As a result, Nova Holdings BVI became the sole shareholder of Nova Macao and Nova Furniture BVI and its subsidiary, Nova Dongguan. In January 2011, Nova Holdings BVI transferred its equity interest in Nova Macao to Nova Furniture BVI. This transaction was accounted for as a reorganization of entities under common control, with assets and liabilities transferred at their carrying amounts, and the financial statements are presented as if the reorganization had occurred retroactively as of the beginning of the first period presented. In January 2011, Nova Furniture BVI issued an additional 9,998 shares of its capital stock, of which 8,123 shares were issued to Nova Holdings BVI and 1,875 shares were issued to St. Joyal, an unrelated U.S. company incorporated in the State of California and engaged in business development and investment activities. Following this issuance, Nova Holdings BVI held 81.25% and St. Joyal held 18.75% of the equity interests in Nova Furniture BVI. St. Joyal is committed to pay $2.4 million by January 1, 2014, in exchange for its 18.75% equity interest in Nova Furniture BVI. As of June 30, 2011, none of the $2.4 million has been paid. On March 17, 2011, Nova Dongguan incorporated Nova Dongguan Chinese Style Furniture Museum (“Nova Museum”) under the laws of the PRC and contributed capital of RMB 1 million. Nova Dongguan made an additional capital contribution of RMB 1.13 million on March 29, 2011. Nova Museum is a non-profit organization engaged principally in the promotion and dissemination of the culture and history of furniture in China. The “Company” and “Nova” collectively refer to Nova Lifestyle, the U.S. parent, Nova Furniture BVI, Nova Dongguan, Nova Museum and Nova Macao. The unaudited consolidated financial statements included herein have been prepared by the Company, pursuant to the rules and regulations of the SEC. The information furnished herein reflects all adjustments (consisting of normal recurring accruals and adjustments) that are, in the opinion of management, necessary to fairly present the operating results for the respective periods. Certain information and footnote disclosures normally present in annual financial statements prepared in accordance with accounting principles generally accepted in the United States of America (“US GAAP”) have been omitted pursuant to such rules and regulations. However, the accounting policies used in preparing these unaudited consolidated financial statements are consistent with those described in the Company’s December 31, 2010, audited consolidated financial statements. These unaudited consolidated financial statements should be read in conjunction with the December 31, 2010 audited consolidated financial statements and footnotes. The results for the six months ended June 30, 2011, are not necessarily indicative of the results to be expected for the full year ending December 31, 2011. The functional currency of Nova Lifestyle, Nova Furniture BVI and Nova Macao is the United States Dollars (“$” or “USD”). Prior to 2011, the functional currency of Nova Macao was the Macau Pataca (“MOP”). The functional currency of Nova Dongguan and Nova Museum is the Chinese Yuan Renminbi (“RMB”). The accompanying financial statements have been translated and presented in USD. The accompanying consolidated financial statements include the accounts of Nova Lifestyle, Nova Furniture BVI, Nova Dongguan, Nova Museum and Nova Macao. All significant inter-company accounts and transactions were eliminated in consolidation. In preparing financial statements in conformity with US GAAP, management makes estimates and assumptions that affect the reported amounts of assets and liabilities and disclosures of contingent assets and liabilities at the dates of the financial statements, as well as the reported amounts of revenues and expenses during the reporting year. Significant estimates, required by management, include the reserve of bad debt allowance, recoverability of long-lived assets and the valuation of inventories. Actual results could differ from those estimates. The Company’s policy is to maintain an allowance for potential credit losses on accounts receivable. Management reviews the composition of accounts receivable and analyzes historical bad debts, customer concentrations, customer credit worthiness, current economic trends and changes in customer payment patterns to evaluate the adequacy of these reserves. Based on historical collection activity, the Company did not record an allowance for bad debts as of June 30, 2011, and December 31, 2010, respectively. Inventories are stated at the lower of cost or market value with cost determined on a weighted average basis, which approximates the first-in first-out method. Management compares the cost of inventories with the net realizable value and an allowance is made for writing down their inventories to market value, if lower. The Company did not record any provision for write-downs of inventory at June 30, 2011, and December 31, 2010. Recoverability of long-lived assets to be held and used is measured by comparing the carrying amount of an asset to the estimated undiscounted future cash flows expected to be generated by the asset. If the carrying amount of an asset exceeds its estimated undiscounted future cash flows, an impairment charge is recognized by the amount by which the carrying amount of the asset exceeds the fair value of the assets. Fair value is generally determined using the asset’s expected future discounted cash flows or market value, if readily determinable. Based on its review, the Company believes that, as of June 30, 2011, and December 31, 2010, there were no significant impairments of its long-lived assets. Research and development costs are related primarily to the Company designing and testing its new products in development stage. Research and development costs are recognized in general and administrative expenses and expensed as incurred. Research and development expense was $64,675 and $35,309 for the six months ended June 30, 2011 and 2010, respectively, and $34,938 and $18,727 for the three months ended June 30, 2011 and 2010, respectively. In its interim financial statements, the Company follows the guidance in ASC 270 “Interim Reporting” and ASC 740 “Income Taxes” whereby the Company utilizes the expected annual effective rate in determining its income tax provisions. For the interim period’s income, this rate differs from the statutory rate primarily as a result of the tax-exempt status of Nova Macao of approximately $(545,000) and ASC 740-10 Uncertain Tax Position of approximately $22,000. Nova Furniture BVI was incorporated in the BVI. There is no income tax for a company domiciled in the BVI. Accordingly, the Company’s consolidated financial statements do not present any income tax provisions related to the BVI tax jurisdiction where Nova Furniture BVI is domiciled. Nova Dongguan and Nova Museum are governed by the Enterprise Income Tax Law of the PRC concerning private-run enterprises and subject to a 25% corporate income tax. Nova Museum may apply for tax-exempt status in 2012, the second year following its incorporation. Nova Macao is an income tax-exempt entity incorporated and domiciled in Macao. During the six months ended June 30, 2011 and 2010, the Company recorded an income tax expense of approximately $378,000 and $513,000, respectively. During the three months ended June 30, 2011 and 2010, the Company recorded an income tax expense of approximately $169,000 and $299,000, respectively. The Company adopted the provisions of ASC Topic 740. When tax returns are filed, it is highly certain that some positions taken would be sustained upon examination by the taxing authorities, while others are subject to uncertainty about the merits of the position taken or the amount of the position that would be ultimately sustained. The benefit of a tax position is recognized in the financial statements in the period during which, based on all available evidence, management believes it is more likely than not that the position will be sustained upon examination, including the resolution of appeals or litigation processes, if any. Tax positions taken are not offset or aggregated with other positions. Tax positions that meet the more-likely-than-not recognition threshold are measured as the largest amount of tax benefit that is more than 50 percent likely of being realized upon settlement with the applicable taxing authority. The portion of the benefits associated with tax positions taken that exceeds the amount measured as described above is reflected as a liability for unrecognized tax benefits in the accompanying balance sheets along with any associated interest and penalties that would be payable to the taxing authorities upon examination. Nova Dongguan is subject to taxation in the PRC and its PRC income tax returns are generally not subject to examination by the PRC tax authorities for tax years before 2006. With a few exceptions, the tax years 2006-2010 remain open to examination by the PRC tax authorities. China’s new Corporate Income Tax Law (“CIT Law”), together with its Implementation Regulations, introduced a set of anti-avoidance measures in Chapter 6 - Special Tax Adjustments. In January 2009, the State Administration of Taxation issued Circular of the State Administration of Taxation on the Issuance of the Implementation Measure of Special Tax Adjustments (“Circular 2”). The regulation is applied retrospectively for tax years beginning after January 1, 2008. Article 3 of Circular 2 states that in respect of transfer pricing administration, relevant tax authorities shall examine business transactions between enterprises and their related parties (“related-party transactions”) and evaluate whether they are conducted on an arm’s-length basis, in addition to conducting investigations and making adjustments, as required under Chapter 6 of the CIT Law and Article 36 of the Tax Collection Law. The significant uncertain tax position arose from the transfer pricing between Nova Dongguan and Nova Macao, wherein the Company determined that the gross profit generated by Nova Dongguan from sales to Nova Macao was materially different from profits generated from sales to third parties. The Statue of Limitation for transfer pricing issue is 10 years starting from the tax year when the transfer pricing issue arises pursuant to the PRC tax law. At June 30, 2011, and December 31, 2010, the Company had cumulatively accrued approximately $197,000 and $175,000, respectively, for estimated interest and penalties related to uncertain tax positions. The Company recorded interest and penalties related to unrecognized tax positions as a component of income tax expense, which totaled approximately $22,000 and $24,000 for the six months ended June 30, 2011 and 2010, respectively. If recognized, the entire balance of unrecognized tax benefits as of June 30, 2011, would affect the Company’s effective tax rate. The Company anticipates no significant change to the total amount of unrecognized tax benefits as of June 30, 2011, within the next 12 months. The Company’s revenue recognition policies are in compliance with ASC Topic 605, “Revenue Recognition.” Sales revenue is recognized when a formal arrangement exists, the price is fixed or determinable, the delivery is completed and no other significant obligations of the Company exist and collectability is reasonably assured. No revenue is recognized if there are significant uncertainties regarding the recovery of the consideration due, or the possible return of the goods. Payments received before all of the relevant criteria for revenue recognition are recorded as unearned revenue. Sales revenue represents the invoiced value of goods, net of value-added taxes (“VAT”). All Company products are sold in the PRC and subject to the Chinese VAT of 17% of the gross sales price. This VAT may be offset by VAT paid by the Company on raw materials and other materials included in the cost of producing the finished product. The Company records VAT payable and VAT receivable net of payments in the financial statements. The VAT tax return is filed offsetting the payables against the receivables. Sales and purchases are recorded net of VAT collected and paid as the Company acts as an agent for the government. In 2010, the Company began entering into area product franchise agreements with customers who operate specialty furniture stores carrying only Nova-branded products. The product franchise agreement provides for the franchisee to retail Nova-brand furniture products for a period of one year from the date of the agreement. The franchisee is required to pay a deposit of RMB 30,000 at the signing of the agreement, which is used as payment for future purchases and is deferred on the Company’s balance sheet as a customer deposit. The franchisee is required to guarantee a minimum purchase amount from the Company during the contract period. The Company has the right to terminate the agreement should the franchisee fail to meet the minimum purchase amounts. The Company provides the franchisee with store images and designs, signage, floor plan product information and training. In addition, the Company will rebate a per square meter subsidy to the franchisee for the store build-out within six months from the agreement date. The franchisee earns 30% of the rebate on its initial purchase from the Company and then at a rate of 5% of each subsequent purchase until fully refunded or six months from the agreement date, whichever is earlier. At June 30, 2011, and December 31, 2010, the Company had franchising subsidy payable of $226,066 and $121,914, respectively. In accordance with ASC 605-50, as the Company does not receive an identifiable benefit from these rebates, the rebates are recorded as a reduction of revenue on sales to the franchisee. Cost of sales consists primarily of material costs, labor costs and related overhead that are directly attributable to the production of the products. Write-down of inventory to the lower of cost or net realizable value is also recorded in the cost of sales. Shipping and handling costs related to delivery of finished goods are included in selling expenses. During the six months ended June 30, 2011 and 2010, shipping and handling costs were $217,942 and $284,838, respectively; during the three months ended June 30, 2011 and 2010, shipping and handling costs were $148,691 and $154,044, respectively. Advertising expenses consist primarily of costs of promotion and marketing for the Company’s image and products, and costs of direct advertising. The Company expenses all advertising costs as incurred. Advertising expense was $225,792 and $23,150 for the six months ended June 30, 2011 and 2010, respectively, and $193,151 and $8,795 for the three months ended June 30, 2011 and 2010, respectively. Basic earnings per share are based on the weighted average number of common shares outstanding during the periods presented. Diluted earnings per share are computed using weighted average number of common shares plus dilutive common share equivalents outstanding during the period. Since the Company does not have any outstanding common share equivalents, the basic and diluted earnings per share are the same. Financial instruments that potentially subject the Company to credit risk consist primarily of accounts and other receivables. The Company does not require collateral or other security to support these receivables. The Company conducts periodic reviews of its clients’ financial condition and customer payment practices to minimize collection risk on accounts receivable. The operations of the Company principally are in the PRC. Accordingly, the Company’s business, financial condition and results of operations may be influenced by the political, economic and legal environments in the PRC, as well as by the general state of the PRC economy. In accordance with FASB ASC Topic 230, “Statement of Cash Flows,” cash flows from the Company’s operations is calculated based upon local currencies. As a result, amounts related to assets and liabilities reported on the statement of cash flows may not necessarily agree with changes in the corresponding balances on the balance sheet. As of June 30, 2011, and December 31, 2010, the Company did not identify any assets and liabilities required to be presented on the balance sheet at fair value. The accompanying consolidated financial statements are presented in USD. The functional currency of Nova Dongguan and Nova Museum is RMB, and, prior to 2011, the functional currency of Nova Macao was MOP. The functional currencies of the Company’s foreign operations are translated into USD for balance sheet accounts using the current exchange rates in effect as of the balance sheet date and for revenue and expense accounts using the weighted-average exchange rate during the fiscal year. The translation adjustments are recorded as a separate component of stockholders’ equity, captioned “Accumulated other comprehensive income (loss).” Gains and losses resulting from transactions denominated in foreign currencies are included in “Other income (expenses)” in the consolidated statements of income and comprehensive income. There have been no significant fluctuations in the exchange rate for the conversion of RMB to USD after the balance sheet date. The Company follows FASB ASC 220 “Reporting Comprehensive Income.” Comprehensive income is comprised of net income and all changes to the statements of stockholders’ equity, except those due to investments by stockholders, changes in paid-in capital and distributions to stockholders. Comprehensive income for the six months ended June 30, 2011 and 2010, included net income and foreign currency translation adjustments. ASC Topic 280, “Segment Reporting,” requires use of the “management approach” model for segment reporting. The management approach model is based on the way a company’s management organizes segments within the company for making operating decisions and assessing performance. Reportable segments are based on products and services, geography, legal structure, management structure, or any other manner in which management disaggregates a company. Management determined that the Company’s operations constitute a single reportable segment in accordance with ASC 280. The Company operates exclusively in one business and industry segment: the design, manufacture and sale of furniture. All of the Company’s long-lived assets for production are located in its facilities in Dongguan, Guangdong Province, China, and operate within the same environmental, safety and quality regulations governing furniture manufacturers. The Company established its subsidiary, Nova Macao, solely for the purpose of marketing and selling the Company’s products. As a result, management views the business and operations of Nova Dongguan and Nova Macao as a blended gross margin when determining future growth, return on investment and cash flows. Nova Museum, a non-profit organization engaged principally in the promotion and dissemination of the culture and history of furniture in China, has no operation nor substantial assets other than its decorations and renovation, and the heritage and cultural assets for the purpose of exhibition only. Accordingly, management concluded that the Company had one reportable segment under ASC 280 because: (i) all of the Company’s products are created with similar production processes, in the same facilities, under the same regulatory environment and sold to similar customers using similar distribution systems; (ii) both Nova Dongguan and Nova Macao operate under the same management with the same resources, and management views the operations of Nova Dongguan and Nova Macao as a whole for making business decision; and (iii) although Nova Museum is principally engaged in the dissemination of the culture and history of furniture in China, it also serves a function of promoting and marketing the Company’s image and products by providing a platform and channel for consumers to be exposed to the Company and its products, it is operated under the same management with the same resources and in the same location as Nova Dongguan, and it is an additive and supplemental unit to the Company’s main operations, the manufacture and sale of furniture. In June 2011, FASB issued ASU 2011-05, Comprehensive Income (ASC Topic 220): Presentation of Comprehensive Income. Under the amendments in this update, an entity has the option to present the total of comprehensive income, the components of net income and the components of other comprehensive income either in a single continuous statement of comprehensive income or in two separate but consecutive statements. In both choices, an entity is required to present each component of net income along with total net income, each component of other comprehensive income along with a total for other comprehensive income and a total amount for comprehensive income. In a single continuous statement, the entity is required to present the components of net income and total net income, the components of other comprehensive income and a total for other comprehensive income, along with the total of comprehensive income in that statement. In the two-statement approach, an entity is required to present components of net income and total net income in the statement of net income. The statement of other comprehensive income should immediately follow the statement of net income and include the components of other comprehensive income and a total for other comprehensive income, along with a total for comprehensive income. In addition, the entity is required to present on the face of the financial statements reclassification adjustments for items that are reclassified from other comprehensive income to net income in the statement(s) where the components of net income and the components of other comprehensive income are presented. The amendments in this update should be applied retrospectively and are effective for fiscal years, and interim periods within those years, beginning after December 15, 2011. The Company is currently assessing the effect that the adoption of this pronouncement will have on its financial statements. In December 2010, FASB issued ASU No. 2010-28, Intangibles – Goodwill and Other (Topic 350): When to Perform Step 2 of the Goodwill Impairment Test for Reporting Units with Zero or Negative Carrying Amounts. The amendments in this update affect all entities that have recognized goodwill and have one or more reporting units whose carrying amount for purposes of performing Step 1 of the goodwill impairment test is zero or negative. The amendments in this update modify Step 1 so that for those reporting units, an entity is required to perform Step 2 of the goodwill impairment test if it is more likely than not that a goodwill impairment exists. In determining whether it is more likely than not that goodwill impairment exists, an entity should consider whether there are any adverse qualitative factors indicating that impairment may exist. The qualitative factors are consistent with existing guidance, which requires that goodwill of a reporting unit be tested for impairment between annual tests if an event occurs or circumstances change that would more likely than not reduce the fair value of a reporting unit below its carrying amount. The amendments in this update are effective for fiscal years, and interim periods within those years, beginning after December 15, 2010. Early adoption is not permitted. Upon adoption of the amendments, any resulting goodwill impairment should be recorded as a cumulative-effect adjustment to retained earnings beginning in the period of an adoption. Any goodwill impairments occurring after the initial adoption of the amendments should be included in earnings. The adoption of this ASU did not have a material impact on the Company’s consolidated financial statements. In December 2010, FASB issued ASU No. 2010-29, Business Combinations (Topic 805): Disclosure of Supplementary Pro Forma Information for Business Combinations. The amendments in this update specify that if a public entity presents comparative financial statements, the entity should disclose revenue and earnings of the combined entity as though the business combination(s) that occurred during the current year had occurred as of the beginning of the comparable prior annual reporting period only. The amendments also expand the supplemental pro forma disclosures to include a description of the nature and amount of material, nonrecurring pro forma adjustments directly attributable to the business combination included in the reported pro forma revenue and earnings. The amendments in this update are effective prospectively for business combinations for which the acquisition date is on or after the beginning of the first annual reporting period beginning on or after December 15, 2010. The Company adopted the disclosure requirements for the business combinations in 2011. In January 2010, FASB issued ASU No. 2010-06, Fair Value Measurements and Disclosures (Topic 820): Improving Disclosures about Fair Value Measurements. This update provides amendments to ASC Topic 820 that will provide more robust disclosures about (1) the different classes of assets and liabilities measured at fair value, (2) the valuation techniques and inputs used, (3) the activity in Level 3 fair value measurements and (4) the transfers between Levels 1, 2 and 3. This standard is effective for interim and annual reporting periods beginning after December 15, 2009, except for the disclosures about purchases, sales, issuances and settlements in the roll forward of activity in Level 3 fair value measurements. Those disclosures are effective for fiscal years beginning after December 15, 2010, and for interim periods within those fiscal years. The adoption of this ASU did not have a material impact on the Company’s consolidated financial statements. As of June 30, 2011, Nova Museum had heritage and cultural assets of $125,554, consisting principally of collectibles and antiques for exhibition. Depreciation need not be provided on heritage assets which have indefinite lives and no reduction in the value with the passage of time; however, the carrying amount of the heritage and cultural assets should be reviewed when there is evidence of impairment in accordance with ASC 360-10. Depreciation expense was $306,511 and $171,015 for the six months ended June 30, 2011 and 2010, respectively, and $154,217 and $86,381 for the three months ended June 30, 2011 and 2010, respectively. Intangible assets consisted of land use right. All land in the PRC is government-owned and cannot be sold to any individual or company. However, the government grants the user a “land use right” to use the land. The Company has the right to use the land for 50 years and is amortizing such rights on a straight-line basis for 50 years. Amortization of intangible assets was $5,512 and $5,282 for the six months ended June 30, 2011 and 2010, respectively, and $2,774 and $2,641 for the three months ended June 30, 2011 and 2010, respectively. Annual amortization expense for the next five years from June 30, 2011, is expected to be approximately $11,000, $11,000, $11,000, $11,000 and $11,000, respectively. Construction in progress represented the factory construction project, which was commenced in 2009. The project was substantially completed in 2010 and passed the required PRC government inspection. The Company is waiting for the property certificate to be issued by the relevant authority, and expects to receive such certificate in October 2011. At June 30, 2011, and December 31, 2010, the Company has construction in progress of $115,891 and $75,498, respectively, of which $38,630 was for employees’ dorm improvements, which was commenced in the second quarter of 2011, and $77,261 was related to the factory construction project. Other receivables represented cash advances to employees and advertising and exhibition deposits. Prepaid expense included prepayments for insurance, advertising and other expense. Other noncurrent assets of $618,085 at June 30, 2011, represented the refundable deposit to an independent contractor for the phase II factory construction project. Total cost of this project is estimated to be $6,155,000. The Company is currently in the process of getting the approval of construction from the related PRC authority, and construction is anticipated to commence within one month from the receipt of such approval. This project is expected to be completed within 18 months from the commencement of the construction. One and two major customers accounted for 34% and 64% (48% and 16% for each) of the Company’s sales for the three months ended June 30, 2011 and 2010, respectively. Two major customers accounted for 43% (32% and 11% for each) and 68% (47% and 21% for each) of the Company’s sales for the six months ended June 30, 2011 and 2010, respectively. Accounts receivable from these customers amounted to $1,488,419 and $1,279,359 as of June 30, 2011, and December 31, 2010, respectively. The Company purchased its products from one major vendor during the six months ended June 30, 2011 and 2010, accounting for 15% and 36% of the purchases, respectively. One major vendor accounted for 15% and 33% of the purchase during the three months ended June 30, 2011 and 2010, respectively. There were no accounts payable to this vendor as of June 30, 2011, and December 31, 2010, respectively. On June 30, 2011, the Company entered into an agreement with its former president and director concurrently with the Share Exchange Agreement and Plan of Reorganization described in Note 1, pursuant to which he returned 10,000,000 shares of the Company’s common stock to the Company for cancelation in exchange for $80,000. The $80,000 was a 90-day note bearing interest at 0.46% per annum payable to the former shareholder. Accrued expenses represented accrued utility and freight expenses. Other payables represented payables to contractors, vendors other than for material purchase and a short-term borrowing. Franchising subsidy represented the accrued amount the Company will pay to its franchisees to support them for franchise store decoration. At June 30, 2011, and December 31, 2010, the Company had $0 and $197,776 due to related party, which was an advance for the Company’s operating needs from a shareholder. This $197,776 advance bore no interest, was payable upon demand and was unsecured. The Company’s president, Ms. Lam, was the co-founder of KTY International Inc. (“KTY”) (DBA: Diamond Sofa), which was the Company’s former customer up to September 2010, at which time KTY ceased doing business with the Company. Ms. Lam subsequently became the Chief Executive Officer of Diamond Bar Outdoors, Inc. (“Diamond Bar”) in October 2010, which had acquired the business of Diamond Sofa. As of date of this report, Ms. Lam has no ownership interest in Diamond Sofa or Diamond Bar. During the six months ended June 30, 2011 and 2010, Diamond Sofa accounted for the Company’s sales of $0 and $740,636, respectively, of the Company’s sales. During the three months ended June 30, 2011 and 2010, Diamond Sofa accounted for $0 and $552,728, respectively, of the Company’s sales. During the six months ended June 30, 2011 and 2010, Diamond Bar accounted for $625,582 and $0, respectively, of the Company’s sales. During the three months ended June 30, 2011 and 2010, Diamond Bar accounted for $261,180 and $0, respectively, of the Company’s sales. The accounts receivable from Diamond Sofa and Diamond Bar was $424,263 and $565,170 at June 30, 2011, and December 31, 2010, respectively. Deferred rent payable represented supplemental payments the Company must pay to the residents who originally lived on the land on which the Company acquired land use rights for commercial use. The Company was required to pay an annual amount at RMB 800 per mu (or 666.67 per square meter) for a total of 60 mu (or 40,000 square meters) starting from 2003 for 60 years. The price increases 10% every 5 years. The Company recorded such expense on a straight-line basis. During the six months ended June 30, 2011 and 2010, the Company recorded expense of $6,538 and $2,398, respectively. During the three months ended June 30, 2011 and 2010, the Company recorded expense of $3,290 and $1,199, respectively. As of June 30, 2011, and December 31, 2010, the Company has $50,786 and $43,169 deferred rent payable, respectively. On December 3, 2009, and December 9, 2009, shareholders made cash contribution of $2 million and $400,000 to the Company, respectively. On September 21, 2010, shareholders contributed an additional $500,000 in cash to the Company. In January 2011, Nova Furniture BVI issued an additional 9,998 shares, of which 8,123 shares were issued to Nova Holdings BVI and 1,875 shares were issued to St. Joyal. St. Joyal is committed to pay $2.4 million by January 1, 2014, in exchange for its 18.75% equity interest in Nova Furniture BVI. As of June 30, 2011, St. Joyal has not made any payment to the Company on the $2.4 million. The Company declared and paid dividends of $0 and $712,370 to its shareholders from Nova Macao’s net income for the six months ended June 30, 2011 and 2010, respectively. Pursuant to the corporate law of the PRC and Macao, Nova Dongguan and Nova Macao are only required to maintain one statutory reserve by appropriating from after-tax profit before declaration or payment of dividends. The statutory reserve represents restricted retained earnings. Nova Dongguan and Nova Macao are required to transfer 10% of net income, as determined under PRC accounting rules and regulations, to a statutory surplus reserve fund until such reserve balance reaches 50% of the Company’s registered capital. The surplus reserve fund is non-distributable other than during liquidation and can be used to fund previous years’ losses, if any, and may be utilized for business expansion or converted into share capital by issuing new shares to existing shareholders in proportion to their shareholdings or by increasing the par value of the shares currently held by them, provided that the remaining reserve balance after such issuance is not less than 25% of the registered capital. At June 30, 2011, and December 31, 2010, Nova Macao had surplus reserve of $6,241, representing 50% of the Company’s registered capital. Nova Dongguan did not make any surplus reserve due to its accumulated deficit. The common welfare fund is a voluntary fund to which the Company can elect to transfer 5% to 10% of its net income. This fund can only be utilized on capital items for the collective benefit of the Company’s employees, such as construction of dormitories, cafeteria facilities, and other staff welfare facilities. This fund is non-distributable other than upon liquidation. The Company does not participate in this voluntary fund. Nova Macao leased an office in Macao under a one-year, automatically renewable lease agreement on May 1, 2010, with an expiration date of April 30, 2011. The monthly rent under this lease was approximately $1,100 (HKD 9,000). The lease agreement renews automatically on an annual basis on its anniversary date. On May 1, 2011, the lease agreement renewed automatically with an expiration date of April 30, 2012. As of June 30, 2011, future rental payment of remaining period until expiration under this operating lease is approximately $11,000. Total rental expense was $6,932 and $6,880 for the six months ended June 30, 2011 and 2010, respectively, and $3,468 and $3,401 was for the three months ended June 30, 2011 and 2010, respectively. Nova Dongguan’s total registered capital is $20 million. As of June 30, 2011, and December 30, 2010, Nova Dongguan has received $10.9 million in capital contributions. The remaining $9.1 million of additional capital contribution is due by November 2011. A former employee of the Company has filed a claim against the Company and alleged the Company breached a contract and failed to pay him RMB 682,022 ($100,000) for the work he performed. An initial hearing was held on April 18, 2011, during which the Company requested dismissal of the claim. The Court issued the judgment on this matter in favor of the Company on May 20, 2011. On June 30, 2011, the Company entered into a one-year employment agreement with Ya Ming Wong to serve as the Company’s Chief Executive Officer. The agreement provides for an annual salary of USD$100,000 and an annual bonus at the sole discretion of the Board, or any committee duly designated by the Board and authorized to act. On June 30, 2011, the Company entered into a one-year employment agreement with Yuen Ching Ho to serve as the Company’s Chief Financial Officer. The agreement provides for an annual salary of USD$80,000 and an annual bonus at the sole discretion of the Board, or any committee duly designated by the Board and authorized to act. On June 30, 2011, the Company entered into a one-year employment agreement with Thanh H. Lam to serve as the Company’s president. The agreement provides for an annual salary of USD$50,000 and an annual bonus at the sole discretion of the Board, or any committee duly designated by the Board and authorized to act. The Company’s operations in the PRC are subject to specific considerations and significant risks not typically associated with companies in the North America and Western Europe. These include risks associated with, among others, the political, economic and legal environments and foreign currency exchange. The Company’s results may be adversely affected by changes in governmental policies with respect to laws and regulations, anti-inflationary measures, currency conversion and remittance abroad, and rates and methods of taxation, among other things. The Company’s sales, purchase and expense transactions are denominated in RMB and MOP (prior to 2011), and all of the Company’s assets and liabilities are also denominated in RMB and MOP (prior to 2011). The RMB is not freely convertible into foreign currencies under the current law. In China, foreign exchange transactions are required by law to be transacted only by authorized financial institutions. Remittances in currencies other than RMB may require certain supporting documentation in order to affect the remittance. The Company has evaluated events that occurred subsequent to June 30, 2011 and through the date the financial statements were issued. Management has concluded that no subsequent events required disclosure in these financial statements. This Quarterly Report on Form 10-Q includes forward-looking statements within the meaning of Section 27A of the Securities Act of 1933, as amended, or the Securities Act, and Section 21E of the Securities Exchange Act of 1934, as amended, or the Exchange Act. We have based these forward-looking statements on our current expectations and projections about future events. These forward-looking statements are subject to known and unknown risks, uncertainties and assumptions about us that may cause our actual results, levels of activity, performance or achievements to be materially different from any future results, levels of activity, performance or achievements expressed or implied by such forward-looking statements. In some cases, you can identify forward-looking statements by terminology such as “may,” “will,” “should,” “could,” “would,” “expect,” “plan,” “anticipate,” “believe,” “estimate,” “continue,” or the negative of such terms or other similar expressions. Factors that might cause or contribute to such a discrepancy include, but are not limited to, those listed under the heading “Risk Factors” and those listed in our other Securities and Exchange Commission filings. The following discussion should be read in conjunction with our Financial Statements and related Notes thereto included elsewhere in this report. Unless the context otherwise requires, references in this report to “we,” “us,” “Nova,” “Nova Lifestyle” or the “Company” refer to Nova Lifestyle, Inc. and its subsidiaries. We design, manufacture and sell modern home furniture for today’s middle class, urban consumer in diverse markets worldwide. We develop high quality residential furniture for the living room, dining room, bedroom and home office in distinctive styles targeted at the medium and upper-medium price ranges. Our products feature classic and contemporary styles offering comfort and functionality in matching furniture collections and upscale luxury pieces appealing to lifestyle-conscious middle and upper middle-income consumers. Our products are sold in the U.S., China, Europe, Australia and to other markets worldwide. Our sales to retail consumers in China have been small relative to our sales to international markets, and until 2010 consisted solely of sales to wholesalers and agents for domestic retailers. In 2010, we began selling products in China under our brands through stores in our newly established franchise network, and, as of June 30, 2011, we have 60 franchise stores established and strategically located in cities across China. In the U.S. and international markets, we design and manufacture our products for direct sales to private label retailers and global furniture distributors that in turn offer our products to retailers under their own brand names. Our logistics, manufacturing and delivery capabilities provide our customers with the flexibility to select from our extensive furniture collections in their respective shipments. Our experience developing products for international markets has enabled us to develop the scale, manufacturing efficiencies and design expertise that serves as the foundation for us to expand aggressively into the highly attractive U.S. and China markets. We are a U.S. holding company with no material assets other than the ownership interests of our wholly owned subsidiaries through which we design, manufacture and sell residential furniture worldwide: Nova Furniture (Dongguan) Co., Ltd. and Nova Furniture Macao Commercial Offshore Limited, which we refer to as Nova Dongguan and Nova Macao, respectively. Nova Dongguan is a wholly foreign-owned enterprise, or WFOE, and was incorporated on June 6, 2003, under the laws of the People’s Republic of China, which we refer to as China or the PRC. Nova Macao was organized on May 20, 2006, under the laws of Macao. Nova Dongguan and Nova Macao are wholly owned subsidiaries of Nova Furniture Limited, which we refer to as Nova Furniture, a corporation organized under the laws of the British Virgin Islands, or the BVI, on April 29, 2003. On March 17, 2011, Nova Dongguan organized Nova Dongguan Chinese Style Furniture Museum, which we refer to as Nova Museum, as a non-profit organization under the laws of the PRC engaged in the promotion of the culture and history of furniture in China. Nova Dongguan provides the design expertise and facilities to manufacture our products, and markets and sells our products in China to stores in our franchise network and to wholesalers and agents for domestic retailers and exporters. Historically, Nova Macao has acted as a trading company, importing, marketing and selling products designed and manufactured by Nova Dongguan and third party manufacturers for international markets. We currently are expanding the operations of Nova Macao to move oversight of manufacturing operations from Nova Dongguan. In connection with our plans to increase the number of stores in our franchise network in China and expand our direct sales to the U.S. and other international markets, we anticipate undertaking a corresponding expansion of our facilities and production capacity at our Nova Dongguan facilities beginning in 2012. This planned expansion will include a new logistics center for the distribution of our products in China and an estimated production capacity increase of 20% for sofa manufacturing. We intend to meet our liquidity requirements, including capital expenditures related to the expansion of our manufacturing facilities and production capacity, purchase of raw materials and the expansion of our business, through cash flow provided by operations and funds raised through offerings of our securities, if and when we determine such offerings are required. Significant factors that we believe could affect our operating results are the (i) cost of raw materials; (ii) prices of our products to our international retailer and wholesaler customers and their markup to end consumers; (iii) consumer acceptance of our new brands and product collections; and (iv) general economic conditions in the U.S., China and other international markets. We have experienced and anticipate continued fluctuation in raw material costs as a result of world economic conditions, such as the price of stainless and carbon steel. We normally can pass the raw material cost increase to our customers, but there may be a time lag as we renegotiate pricing with our customers on existing products and introduce new product collections. We believe most of our customers are willing to pay us higher prices for our high quality and stylish products, timely delivery and strong production capacity, which we expect will allow us to maintain high gross profit margins for our products. We have diversified our products by introducing brands and product collections exclusively for China and higher-end products for the U.S. and international markets. Consumer preference trends favoring high quality and stylish products and lifestyle-based furniture suites also should allow us to maintain our high gross profit margins. We believe we will benefit from a number of favorable recent economic trends, including reports by the International Monetary Fund in its April 2011 “World Economic Outlook” that worldwide GDP grew 5.0% in 2010 and anticipates further growth of 4.4% in 2011, with real growth in furniture demand for the world’s top 70 countries forecasted at 3.3% in 2011 according to the “World Furniture Outlook 2011” issued by the Centre for Industrial Studies. We believe that our expansion of direct sales in China and the U.S. will have a positive impact on our net sales and net income, while helping to diversify our customer base and end consumer markets. We were incorporated in the State of Nevada on September 9, 2009, under the name Stevens Resources, Inc., as an exploration stage company with no revenues and no operations engaged in the search for mineral deposits or reserves. Effective as of June 27, 2011, in anticipation of the Share Exchange Agreement and related transactions described below, we changed our name to Nova Lifestyle, Inc. through a merger with our wholly owned, non-operating subsidiary established solely to change our name pursuant to Nevada law. Concurrently with this action, we authorized a 5-for-1 forward split of our common stock effective June 27, 2011. Prior to the forward split, we had 2,596,000 shares of our common stock outstanding, and, after giving effect to the forward split and immediately prior to the Share Exchange Agreement and related transactions described below, we had 12,980,000 shares of our common stock outstanding. We authorized the forward stock split to provide a sufficient number of shares to accommodate the trading of our common stock in the OTC marketplace after our acquisition of Nova Furniture. Nova Furniture was incorporated on April 29, 2003, by our Chairman and Chief Executive Officer, Ya Ming Wong, and Chief Financial Officer, Yuen Ching Ho. Nova Furniture subsequently formed Nova Dongguan as a WFOE on June 6, 2003. On March 8, 2005, Messrs. Wong and Ho formed Nova Furniture Holdings Limited, which we refer to as Nova Holdings, a corporation organized under the laws of the BVI, and transferred their equity interests in Nova Furniture to Nova Holdings. As a result of this transaction, Nova Furniture became a wholly owned subsidiary of Nova Holdings. Nova Holdings subsequently formed two wholly owned subsidiaries as trading companies for Nova Dongguan products: Nova Furniture Hong Kong Limited, which we refer to as Nova Hong Kong, a company incorporated under the laws of Hong Kong, on April 19, 2005, and Nova Macao on May 20, 2006. Nova Hong Kong ceased doing business in October 2010 to consolidate trading operations, and on February 28, 2011, Nova Holdings applied to the relevant Hong Kong government authorities to deregister the subsidiary. On January 3, 2011, Nova Furniture issued an additional 9,998 shares of its capital stock, of which 8,123 shares were issued to Nova Holdings and 1,875 shares were issued to St. Joyal, an unrelated California corporation engaged in business investment and development that has provided consulting services to Nova Furniture. Following this issuance, Nova Holdings held 81.25% and St. Joyal held 18.75% of the equity interests in Nova Furniture. St. Joyal is committed pursuant to a shareholder agreement dated January 1, 2011, to pay $2.4 million by January 1, 2014, for its 18.75% equity interest in Nova Furniture, of which no payments have been received as of June 30, 2011. St. Joyal also plans to assist in expanding our direct sales customer base in the U.S. On January 14, 2011, Nova Holdings transferred its equity interest in Nova Macao to Nova Furniture, which was accounted for as a reorganization of entities under common control. As a result of this transaction, Nova Macao became a wholly owned subsidiary of Nova Furniture. On March 17, 2011, Nova Dongguan organized Nova Museum as a non-profit organization under the laws of the PRC engaged in the promotion of the culture and history of furniture in China. We acquired the ordinary shares of Nova Furniture pursuant to the terms of a Share Exchange Agreement and Plan of Reorganization, dated June 30, 2011, or the Share Exchange Agreement, entered into by and between us, Nova Furniture and the four shareholders of Nova Holdings and St. Joyal, which are the two shareholders of Nova Furniture. Messrs. Wong and Ho are the two shareholders of Nova Holdings, and Jun Jiang and Qiang Liu are the two shareholders of St. Joyal; we collectively refer to these four shareholders as the Nova Furniture Shareholders. Pursuant to the Share Exchange Agreement, we issued 11,920,000 shares of our common stock to the Nova Furniture Shareholders in exchange for their 10,000 ordinary shares of Nova Furniture, consisting of all of its issued and outstanding capital stock. Of the 11,920,000 shares of our common stock issued pursuant to the Share Exchange Agreement, Messrs. Wong and Ho each received 4,842,500 shares and Messrs. Jiang and Liu each received 1,117,500 shares. Concurrently with the Share Exchange Agreement and as a condition thereof, we entered into an agreement with our former president and director pursuant to which he returned 10,000,000 shares of our common stock to us for cancelation in exchange for an unsecured 90-day promissory note of $80,000 bearing interest at 0.46% per annum. Upon completion of the foregoing transactions, we had 14,900,000 shares of our common stock issued and outstanding. For accounting purposes, the Share Exchange Agreement and concurrent transactions described above were treated as a reverse acquisition and recapitalization of Nova Furniture because, prior to the transactions, we were a non-operating public shell and, subsequent to the transactions, the Nova Furniture Shareholders owned a majority of our outstanding common stock and exercise significant influence over the operating and financial policies of the consolidated entity. Our recent operations prior to our acquisition of Nova Furniture on June 30, 2011, have been limited to the operations of Nova Furniture and its wholly owned subsidiaries. While our significant accounting policies are described more fully in Note 2 to our consolidated financial statements for the six months ended June 30, 2011 and 2010, we believe the following accounting policies are the most critical to aid you in fully understanding and evaluating this management discussion and analysis. 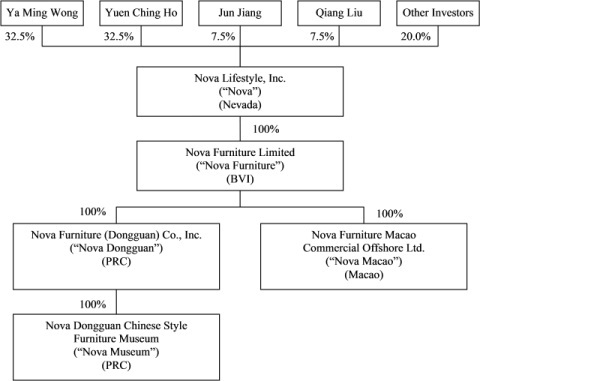 The accompanying consolidated financial statements have been prepared in conformity with generally accepted accounting principles in the U.S., or U.S. GAAP, for Nova Lifestyle and its subsidiaries, Nova Furniture, Nova Dongguan, Nova Macao and Nova Museum. The functional currency of Nova Lifestyle, Nova Furniture and Nova Macao is U.S. dollars, or USD. Prior to 2011, the functional currency of Nova Macao was the Macau Pataca, or MOP. The functional currency of Nova Dongguan and Nova Museum is RMB. The accompanying financial statements have been translated and presented in USD. In preparing financial statements in conformity with U.S. GAAP, management makes estimates and assumptions that affect the reported amounts of assets and liabilities and disclosures of contingent assets and liabilities at the dates of the financial statements, as well as the reported amounts of revenues and expenses during the reporting year. Significant estimates, required by management, include the reserve of bad debt allowance, recoverability of long-lived assets and the valuation of inventories. Actual results could differ from those estimates. Our policy is to maintain an allowance for potential credit losses on accounts receivable. Management reviews the composition of accounts receivable and analyzes historical bad debts, customer concentrations, customer credit worthiness, current economic trends and changes in customer payment patterns to evaluate the adequacy of these reserves. Inventories are stated at the lower of cost or market value with cost determined on a weighted average basis, which approximates the first-in first-out method. Management compares the cost of inventories with the net realizable value and an allowance is made for writing down their inventories to market value, if lower. Research and development costs are related primarily to our designing and testing of new products in the development stage. Research and development costs are recognized in general and administrative expenses and expensed as incurred. Our revenue recognition policies are in compliance with ASC Topic 605, “Revenue Recognition.” Sales revenue is recognized when a formal arrangement exists, the price is fixed or determinable, the delivery is completed, no other significant obligations of ours exist and collectability is reasonably assured. No revenue is recognized if there are significant uncertainties regarding the recovery of the consideration due, or the possible return of the goods. Payments received before all of the relevant criteria for revenue recognition are recorded as unearned revenue. Sales revenue represents the invoiced value of goods, net of value-added taxes, or VAT. All of our products are sold in the PRC and subject to VAT of 17% of the gross sales price. This VAT may be offset by VAT paid by us on raw materials and other materials included in the cost of producing the finished product. We recorded VAT payable and VAT receivable net of payments in the financial statements. The VAT tax return is filed offsetting the payables against the receivables. Sales and purchases are recorded net of VAT collected and paid when we act as an agent for the PRC government. Cost of sales consists primarily of material costs, labor costs and related overhead directly attributable to the production of the products. Write-down of inventory to the lower of cost or net realizable value and warranty expense, which historically has been nominal, also are recorded in the cost of sales. The accompanying consolidated financial statements are presented in USD. The functional currency of our wholly owned PRC subsidiaries, Nova Dongguan and Nova Museum, is RMB. The functional currency of Nova Macao prior to 2011 was MOP and, as of January 1, 2011, USD. The functional currencies of our foreign operations are translated into USD for balance sheet accounts using the current exchange rates in effect as of the balance sheet date and for revenue and expense accounts using the weighted-average exchange rate during the fiscal year. The translation adjustments are recorded as a separate component of stockholders’ equity, captioned “Accumulated other comprehensive income (loss).” Gains and losses resulting from transactions denominated in foreign currencies are included in “Other income (expenses)” in the consolidated statements of income and comprehensive income. There have been no significant fluctuations in the exchange rate for the conversion of RMB and MOP to USD after the balance sheet date. Management determined that our operations constitute a single reportable segment in accordance with ASC 280. We operate exclusively in one business: the design, manufacture and sale of furniture. All of our long-lived assets for production are located in our facilities in Dongguan, Guangdong Province, China, and operate within the same environmental, safety and quality regulations governing furniture manufacturers. We established our subsidiary, Nova Macao, solely for the purpose of marketing and selling our products. As a result, management views the business and operations of Nova Dongguan and Nova Macao as a blended gross margin when determining future growth, return on investment and cash flows. Nova Museum, a non-profit organization engaged principally in the promotion and dissemination of the culture and history of furniture in China, has no operations nor substantial assets other than its decorations and renovation, and the heritage and cultural assets for the purpose of exhibition only. Accordingly, management has concluded that we had one reportable segment under ASC 280 because: (i) all of our products are created with similar production processes, in the same facilities, under the same regulatory environment and sold to similar customers using similar distribution systems; (ii) both Nova Dongguan and Nova Macao are operated under the same management with the same resources, and management views the operations of Nova Dongguan and Nova Macao as a whole for making business decision; and (iii) although Nova Museum is mainly for disseminating the culture and history of furniture in China, it also serves a function of promoting and marketing our image and products by providing the platform and channel for consumers to be exposed to our furniture, it is operated under the same management with the same resources and is an additive and supplemental unit to our main operation, the manufacture and sale of furniture. In June 2011, FASB issued ASU 2011-05 Comprehensive Income (ASC Topic 220): Presentation of Comprehensive Income. Under the amendments in this update, an entity has the option to present the total of comprehensive income, the components of net income and the components of other comprehensive income either in a single continuous statement of comprehensive income or in two separate but consecutive statements. In both choices, an entity is required to present each component of net income along with total net income, each component of other comprehensive income along with a total for other comprehensive income, and a total amount for comprehensive income. In a single continuous statement, the entity is required to present the components of net income and total net income, the components of other comprehensive income and a total for other comprehensive income, along with the total of comprehensive income in that statement. In the two-statement approach, an entity is required to present components of net income and total net income in the statement of net income. The statement of other comprehensive income should immediately follow the statement of net income and include the components of other comprehensive income and a total for other comprehensive income, along with a total for comprehensive income. In addition, the entity is required to present on the face of the financial statements reclassification adjustments for items that are reclassified from other comprehensive income to net income in the statement(s) where the components of net income and the components of other comprehensive income are presented. The amendments in this update should be applied retrospectively and are effective for fiscal years, and interim periods within those years, beginning after December 15, 2011. We are currently assessing the effect that the adoption of this pronouncement will have on our financial statements. In December 2010, FASB issued ASU No. 2010-28, Intangibles – Goodwill and Other (Topic 350): When to Perform Step 2 of the Goodwill Impairment Test for Reporting Units with Zero or Negative Carrying Amounts. The amendments in this update affect all entities that have recognized goodwill and have one or more reporting units whose carrying amount for purposes of performing Step 1 of the goodwill impairment test is zero or negative. The amendments in this update modify Step 1 so that for those reporting units, an entity is required to perform Step 2 of the goodwill impairment test if it is more likely than not that a goodwill impairment exists. In determining whether it is more likely than not that goodwill impairment exists, an entity should consider whether there are any adverse qualitative factors indicating that impairment may exist. The qualitative factors are consistent with existing guidance, which requires that goodwill of a reporting unit be tested for impairment between annual tests if an event occurs or circumstances change that would more likely than not reduce the fair value of a reporting unit below its carrying amount. The amendments in this update are effective for fiscal years, and interim periods within those years, beginning after December 15, 2010. Early adoption is not permitted. Upon adoption of the amendments, any resulting goodwill impairment should be recorded as a cumulative-effect adjustment to beginning retained earnings in the period of an adoption. Any goodwill impairments occurring after the initial adoption of the amendments should be included in earnings. The adoption of this ASU did not have a material impact on our consolidated financial statements. In December 2010, FASB issued ASU No. 2010-29, Business Combinations (Topic 805): Disclosure of Supplementary Pro Forma Information for Business Combinations. The amendments in this update specify that if a public entity presents comparative financial statements, the entity should disclose revenue and earnings of the combined entity as though the business combination(s) that occurred during the current year had occurred as of the beginning of the comparable prior annual reporting period only. The amendments also expand the supplemental pro forma disclosures to include a description of the nature and amount of material, nonrecurring pro forma adjustments directly attributable to the business combination included in the reported pro forma revenue and earnings. The amendments in this update are effective prospectively for business combinations for which the acquisition date is on or after the beginning of the first annual reporting period beginning on or after December 15, 2010. We intend to adopt the disclosure requirements for any business combinations in 2011 and thereafter. In January 2010, FASB issued ASU No. 2010-06, Fair Value Measurements and Disclosures (Topic 820): Improving Disclosures about Fair Value Measurements. This update provides amendments to ASC Topic 820 that will provide more robust disclosures about (1) the different classes of assets and liabilities measured at fair value, (2) the valuation techniques and inputs used, (3) the activity in Level 3 fair value measurements, and (4) the transfers between Levels 1, 2, and 3. This standard is effective for interim and annual reporting periods beginning after December 15, 2009, except for the disclosures about purchases, sales, issuances, and settlements in the roll forward of activity in Level 3 fair value measurements. Those disclosures are effective for fiscal years beginning after December 15, 2010, and for interim periods within those fiscal years. The adoption of this ASU did not have a material impact on our consolidated financial statements. During the three months ended June 30, 2011, we had net sales of $9.26 million, an increase of 15% from $8.09 million in the same period of 2010. This increase was due primarily to our 1.55% increase in sales volume and 6% increase in average selling price in the second quarter of 2011 compared to the second quarter of 2010. We increased sales of our higher margin products, such as our sofas, as well as increased sales volume on finished goods purchased from third party manufacturers for order fulfillment in China and international markets. Our sales and marketing strategy in 2011 includes diversifying our international sales by expanding direct sales to retailers and chain stores worldwide with a focus on the U.S. market, which historically is the largest market worldwide for sales of imported furniture. Sales to North America increased 134% during the second quarter of 2011 to $2.51 million compared to $1.07 million in the second quarter of 2010, but were partially offset by decreased sales to our other principal international markets, Europe, Australia and Asia. As part of our gradual change in sales and marketing strategy in 2011, we removed some older and lower margin products for international markets from production in the first quarter of 2011 to be replaced by new product models. Sales to Europe and Australia were $3.32 million in the second quarter of 2011, down 26% from $4.46 million in the second quarter of 2010, as our customers reduced their orders during this inventory transition, but we anticipate European and Australian sales volume for the entire 2011 year to be on par with sales volume in 2010 as we ramp up our introduction of the new product models. We are seeing sales volume to Europe return already in 2011, with sales up 81% to $3.16 million in the second quarter of 2011 compared to $1.75 million in the first quarter of 2011. A depressed real estate market in Hong Kong and challenging economic climate in Asia resulted in sales of $271,000 to these regions in the second quarter of 2011, a decrease from $598,000 in the same period of 2010. Our change in sales and marketing strategy also involves increasing sales in China as a percentage of total sales, primarily through sales to our expanding network of product franchise stores. Sales in China, which includes sales to franchisees in addition to wholesalers and agents to domestic retail stores and distributors for the export market, accounted for 31% of our total sales in the 2011 period compared to 23% of our total sales in the 2010 period. Sales from franchisees selling our branded products in China contributed approximately $1.66 million or 58% of our total China sales in the second quarter of 2011 compared to sales of $269,000 or 14% of the total China sales in the second quarter of 2010. We first entered into product franchise agreements with stores in China during the first quarter of 2010, with sales commencing during the second quarter of 2010. Overall sales in China increased $1.0 million as we expanded our franchise network and the retail market in China for our products with sales of $2.88 million in the 2011 period compared to $1.88 million in the 2010 period. We anticipate increasing sales volume in China as our franchise network continues to expand. Cost of sales consists primarily of material costs, labor costs and related overhead directly attributable to the production of our products. Cost of sales increased to $0.79 million for the three months ended June 30, 2011, representing a 13% increase compared to $6.02 million for the same period in 2010, due primarily to an increase in sales. Cost of sales as a percentage of net sales was 74% for both the second quarter of 2011 and 2010, which was due primarily to an average increase of 6% in selling price in both China and international markets and to changes in our sales and marketing strategy, but offset by increased cost of material, labor and finished goods from third party manufacturers. We expect costs of sales to decrease going forward as we gradually change our sales and marketing strategy to reduce production volume of low margin products. As part of our strategy to expand direct sales in China and diversify our customers in international markets, we increased sales in China to stores in our franchise network, reduced sales of some low margin products in international markets and adjusted and increased the selling price of certain contracts in international markets. Gross profit increased 19% to $2.45 million for the three months ended June 30, 2011, as compared to $2.07 million for the same period in 2010. Our gross profit margin was 26% for both the second quarter of 2011 and 2010. Gross profit margin in the 2011 period was the same rate as the 2010 period, which was due primarily to an overall average selling price increase of approximately 6% and changes in our sales and marketing strategy, including increased sales in China to stores in our franchise network, reduced sales of some low margin products in international markets and adjusting and increasing the selling price of certain contracts in international markets, including turning away some orders in international markets that did not meet our profit margin requirements. Management believes that our gross profit margin will be stable at approximately 30% as our mix of products broadens and more of the increased raw materials costs are passed through to customers as we renegotiate pricing with our customers on existing products and introduce new product collections. Operating expenses consisted of selling, general and administrative expenses. Operating expenses were $1.67 million for the three months ended June 30, 2011, an increase of 207% as compared to $0.54 million for the 2010 period. Selling expense increased $0.33 million or 133%, due primarily to an increase of $0.13 million in salary and commission to sales persons and $0.2 million in marketing expense including travelling expense, advertisement and promotional expense as a result of our expanding in the China retail market and the increased sales during the second quarter of 2011. General and administration expense increased $0.80 million or 269%, due primarily to an increase of $0.45 million in employee compensation and employee welfare from the expansion of our workforce, $0.02 million of research and development and $0.16 million of auditing and legal expense from our acquisition of Nova Furniture and increased compliance costs as a U.S. public company. Other expense was $38,952 in the three months ended June 30, 2011, compared with other expense of $12,421 in the 2010 period, an increase of $26,531. The increase in other expense was due primarily to increased foreign exchange transaction loss for our sales in international markets. Net income was $0.58 million in the three months ended June 30, 2011, a decrease of 52% from $1.21 million in the 2010 period. Our net profit margin was 6% for the three months ended June 30, 2011, a decrease of 9% from 15% for the 2010 period, due primarily to the increased operating expenses despite the increased revenue and an increase in gross profit margin. During the six months ended June 30, 2011, we had net sales of $14.89 million, a decrease of 1% from $15.10 million in the same period of 2010. This decrease was due primarily to our 10% decrease in sales volume in the six months ended June 30, 2011, despite an overall average selling price increase of approximately 7% compared to the same period of 2010 as we increased the sales volume of our higher margin products and finished goods purchased from third party manufacturers for order fulfillment in China and international markets. In the six months ended June 30, 2011, our sales to international markets decreased $1.18 million from the same period of 2010 principally as a result of decreased sales to Europe, Australia and Asia, but offset by increased sales to North America. As part of our gradual change in sales and marketing strategy in 2011, we removed some older and lower margin products for international markets from production in the first quarter of 2011 to be replaced by new product models. Sales to Europe and Australia were $5.22 million for the six months ended June 30, 2011, down 35% from $8.05 million in the same period of 2010 as our customers reduced their orders during this inventory transition, but we anticipate European and Australian sales volume for the entire 2011 year to be on par with sales volume in 2010 as we ramp up our introduction of the new product models. A depressed real estate market in Hong Kong and challenging economic climate in Asia resulted in sales of $0.54 million to these regions in the six months ended June 30, 2011, a decrease from $1.28 million in the same period of 2010. North American sales increased 128% to $3.78 million in the six months ended June 30, 2011, compared to $1.66 million in the same period of 2010, offsetting the decrease in sales in other international markets as we focused on expanding our direct sales to the U.S. market. Our change in sales and marketing strategy also involves increasing sales in China as a percentage of total sales, primarily through sales to our expanding network of product franchise stores. Sales in China, which includes sales to franchisees in addition to wholesalers and agents to domestic retail stores and distributors for the export market, accounted for 33% of our total sales in the 2011 period compared to 26% of our total sales in the 2010 period. Sales from franchisees selling our branded products in China contributed approximately $2.35 million or 47% of our total China sales during the six months ended June 30, 2011 compared to $269,000 or 7% in the same period of 2010. We first entered into product franchise agreements with stores in China during the first quarter of 2010, with sales commencing during the second quarter of 2010. Overall sales in China increased, with sales of $4.95 million in the 2011 period compared to $3.97 million in the 2010 period. We anticipate increasing sales volume in China as our franchise network continues to expand. Cost of sales consists primarily of material costs, labor costs and related overhead directly attributable to the production of our products. Cost of sales decreased to $10.65 million for the six months ended June 30, 2011, representing a 7% decrease compared to $11.49 million for the same period in 2010, due primarily to a decrease in sales and production volume. Cost of sales as a percentage of net sales was 72% for the 2011 period as compared to 76% for the 2010 period, which was due primarily to an average increase of 7% in selling price in both China and international markets and to changes in our sales and marketing strategy. As part of our strategy to expand direct sales in China and diversify our customers in international markets, we increased sales in China to stores in our franchise network, reduced sales of some low margin products in international markets and adjusted and increased the selling price of certain contracts in international markets. Gross profit increased 18% to $4.24 million for the six months ended June 30, 2011, as compared to $3.60 million for the same period in 2010. Our gross profit margin increased to 28% for the 2011 period compared to 24% for the 2010 period. Gross profit margin increased in the 2011 period as a result of decreased cost of sales as a percentage of net sales, which was due primarily to an overall average selling price increase of approximately 7% and changes in our sales and marketing strategy, including increased sales in China to stores in our franchise network, reduced sales of some low margin products in international markets and adjusting and increasing the selling price of certain contracts in international markets, including turning away some orders in international markets that did not meet our profit margin requirements. Management believes that our gross profit margin will be stable at approximately 30% as our mix of products broadens and more of the increased raw materials costs are passed through to customers as we renegotiate pricing with our customers on existing products and introduce new product collections. Operating expenses consisted of selling, general and administrative expenses. Operating expenses were $2.21 million for the six months ended June 30, 2011, an increase of 123% compared to $0.99 million for the 2010 period. Selling expense increased $0.32 million or 67%, due primarily to the an increase of $0.17 million in salary and commission to sales persons and $0.17 million in marketing expense including advertisement and promotional expense as a result of our expanding in the China retail market and the increased sales during the six months ended June 30, 2011. General and administration expense increased $0.90 million or 175%, due primarily to an increase of $0.46 million in employee compensation and employee welfare from the expansion of our workforce, $0.03 million of research and development and $0.29 million of auditing and legal expense from our acquisition of Nova Furniture and increased compliance costs as a U.S. public company. Other expense was $66,577 in the six months ended June 30, 2011, compared with other expense of $13,199 in the 2010 period, an increase of $53,378. The increase in other expense was due primarily to increased foreign exchange transaction loss for our sales in international markets. Net income was $1.59 million in the six months ended June 30, 2011, a decrease of 24% from $2.08 million in the 2010 period. Our net profit margin was 11% for the six months ended June 30, 2011, a decrease of 3% from 14% for the 2010 period, due primarily to the increased operation expenses despite the decreased cost of sales percentage and an increase in gross profit margin. Our principal demands for liquidity are to increase sales in China, purchase inventory and for sales distribution and general corporate purposes. We intend to meet our liquidity requirements, including capital expenditures related to the expansion of our manufacturing facilities and production capacity, purchase of raw materials and the expansion of our business, primarily through cash flow provided by operations and collections of accounts receivable. We currently are attempting to raise financing through an offering of our common stock, but there can be no assurance that any financing arrangements will be available in amounts or on terms acceptable to us, if at all. We may seek additional financing in the form of bank loans or funds raised through offerings of our equity or debt, if and when we determine such offerings are required. We had net working capital of $7,279,213 at June 30, 2011, an increase of $868,454 from net working capital of $6,410,759 at December 31, 2010. The ratio of current assets to current liabilities was 2.57-to-1 at June 30, 2011. Net cash provided by operating activities was $0.32 million for the six months ended June 30, 2011, a decrease of $1.93 million or 86% from $2.25 million for the 2010 period. The decrease in cash inflow was attributable primarily to a decreased net income, increased accounts receivable outstanding, other current assets and payment for other assets including $0.62 million deposit to an independent contractor for a factory construction project which we expect to commence within one month of the relevant PRC authority approving of our application for the planned construction. Net cash used in investing activities was $0.45 million for the six months ended June 30, 2011, a decrease of $2.75 million or 86% from $3.2 million for the 2010 period. In the 2011 period, we paid $0.28 million for the acquisition of property and equipment, $0.12 million for the acquisition of heritage and cultural assets for Nova Museum and $0.04 million in construction in progress for improving the employees’ dorm. In the 2010 period, we paid $0.46 million for property and $2.73 million for construction in progress of the new building and factory. Net cash used in financing activities was $0.20 million for the six months ended June 30, 2011, compared to $0.49 million for the 2010 period. In the six months ended June 30, 2011, we had $200,243 of net advances to related parties, and the proceeds of $60,167 from a short-term borrowing that was repaid during the second quarter of 2011. In the 2010 period, we made a dividend payment of $0.71 million to our shareholders and $0.22 million advance from shareholder. As of June 30, 2011, we had accounts receivable of $9,114,559, of which $6,667,363 was with aging within 90 days, $1,273,217 was with aging over 90 days and within 180 days, and $1,173,980 was with aging over 180 days and within 270 days. As of August 11, 2011, we have collected $408,724 of the accounts receivable with aging over 180 days as of June 30, 2011, with $765,256 remaining outstanding. The increase in accounts receivable was mainly a result of increased sales during the second quarter of 2011. On November 16, 2009, the Foreign Trade and Economic Cooperation Bureau of Dongguan approved an increase in the registered capital of Nova Dongguan from $8 million to $20 million, with the $12 million in additional contribution of capital to be paid within two years. As of June 30, 2011, Nova Dongguan has received additional capital contributions of $2.9 million from its shareholders. We may need to fund the remaining registered capital requirement of Nova Dongguan through financing activities, including cash flow provided by operations and funds raised through offerings of our securities, if and when we determine such offerings are required. If we are unable to fund the remaining $9.1 million in additional contribution of capital by November 16, 2011, we may apply to the relevant PRC government agencies for an extension or reduction of the registered capital requirement. The relevant PRC government agencies may extend the contribution period for an additional six months without penalty, and, upon application, grant a further three-month grace period without penalty. If the capital contribution remains incomplete after the extensions and grace periods have been exhausted or denied, Nova Dongguan may be required to pay a negotiated penalty, typically 3% to 5% of the unsatisfied contribution of capital remaining outstanding, or up to $455,000 based on the amount remaining outstanding as of June 30, 2011. After a six-month period following payment of any such penalty, Nova Dongguan may request a reduction of its registered capital to the amount already contributed with the outstanding balance waived without risk of business license revocation. Although repatriation of profits or dividends by Nova Dongguan will require approval by the SAFE until the contribution of capital is satisfied or the registered capital requirement is reduced to the amount contributed, based upon our relationship with the relevant PRC government agencies and prior requests, we believe that such approval would be granted. Our standard payment term for accounts receivable is 30 - 120 days. We give an extended payment term to certain of our major customers of up to 180 days, but have since reduced this payment term to 120 days beginning in 2011. During the six months ended June 30, 2011, we had accounts receivable turnover of 3.82 on an annualized basis, with sales outstanding of 95 days and inventory turnover of 21.55 on an annualized basis. To attract franchisees to our new franchise network in 2010, we granted new store operators a payment term of 90 days. We have a short history of collections with franchisees, but based on subsequent collections, we fully expect payment. Our management assesses the financial position, credit quality, credit history and other factors such as current market conditions before entering into product franchise agreements with new store operators to help ensure the franchisee’s ability to make payment in a timely manner. We retain the right to review and assess the performance of franchisees annually under the product franchise agreement, enabling our termination of franchises that fail to meet certain performance targets or make payments on product orders. We have since started phasing out these preferential terms in 2011, and our current product franchise agreement contains no preferential payment term, requiring payment in full before delivery. Management expects sales outstanding from sales in China to decrease correspondingly going forward in 2011. Sales to international markets typically are made through letters of credit, but for some long-term, high volume customers, such as Actona Company, we accept telegraphic transfer, or T/T, with a payment term of 15 days after delivery. Historically, we have not experienced bad debts from our sales to international markets. Our accounts receivable related to sales to international markets typically are less than three months, depending on customer shipment schedules. In 2011, we changed our sales and marketing strategy to cease sales of certain low-margin products, which was a principal reason for the decrease in sales during the first quarter of 2011, despite these lower-margin customers usually receiving shorter payment terms. This new sales and marketing strategy, in addition to reducing payment terms for certain major customers, caused a temporary reduction of sales while retaining the high accounts receivable outstanding as of June 30, 2011. We expect the balance of accounts receivable to decrease as our new sales strategy and shortened payment term to our major customers in the international markets takes effect along with our new payment term for franchisees. For these reasons, management believes that the recording of an allowance for doubtful accounts is not necessary based on historical collections. Disclosure controls and procedures (as defined in Rule 13a-15(e) and Rule 15d-15(e) of the Exchange Act) include, without limitation, controls and procedures designed to ensure that information required to be disclosed by us in the reports that we file or submit under the Exchange Act is recorded, processed, summarized and reported within the time periods specified in SEC rules and forms. We also accumulate and communicate this information to our management, including our principal executive and principal financial officers, or persons performing similar functions, as appropriate to allow timely decisions regarding required disclosure. An evaluation was conducted under the supervision and with the participation of our management, including our principal executive officer, or CEO, and principal financial officer, or CFO, of the effectiveness of the design and operation of our disclosure controls and procedures as of June 30, 2011. Based on that evaluation, the CEO and CFO concluded that our disclosure controls and procedures were not effective as of such date because of the material weaknesses identified in our internal control over financial reporting identified below. Notwithstanding these material weaknesses, our management has concluded that our consolidated financial statements for the periods covered by and included in this report are prepared in accordance with U.S. GAAP and fairly present, in all material respects, our financial position, results of operations and cash flows for each of the periods presented herein. Immediately upon completion of our acquisition of Nova Furniture on June 30, 2011, the internal control over financial reporting relevant to Nova Furniture replaced substantially all of the legacy internal controls of our predecessor shell company. In addition, our prior officer and director resigned and we elected two new directors to our Board of Directors and appointed new management, including the separation of the offices of the principal executive officer, principal financial officer and president. Consequently, on June 30, 2011, our internal control over financial reporting as defined in Rule 13a-15(f) of the Exchange Act was materially affected because of our acquisition of Nova Furniture. inadequate policies and procedures for inventory caused by a failure to design, establish and maintain effective documented financial accounting policies and procedures related to inventory pricing and valuation. Furthermore, as of June 30, 2011, our Board of Directors lacks independent directors and an audit committee, and we lack sufficient accounting personnel with appropriate understanding of U.S. GAAP and SEC reporting requirements. We are developing certain remediation steps to address these material weaknesses and to improve our internal control over financial reporting. We intend to add independent directors to our Board of Directors and establish an Audit Committee as a separately designated committee of the Board of Directors with a written charter. We also intend to appoint an “audit committee financial expert” as defined under Item 407(d)(5) of Regulation S-K. We plan to seek the advice of outside consultants and use internal resources to implement additional controls. We employ accountants in the U.S. to assist with the preparation of our financials in accordance with U.S. GAAP. Notwithstanding this common practice for U.S. public companies with substantially all of their operations in China, in certain instances, we may not maintain sufficient staff in China with technical accounting expertise regarding these requirements. We plan to hire additional credentialed professional staff and consulting professionals with greater knowledge of U.S. GAAP in our operations and the requirements of Section 404 of the Sarbanes-Oxley Act to oversee our financial reporting process in order to ensure our compliance with U.S. GAAP and the relevant securities laws. In addition, we plan to provide additional training to our accounting staff on U.S. GAAP, the Sarbanes-Oxley Act and the requirements of the PCAOB regarding the preparation of financial statements. We believe the measures described above will facilitate remediation of the material weaknesses identified above and will continue to strengthen our internal control over financial reporting. As we continue to evaluate and work to improve our internal control over financial reporting, we may determine that additional measures are necessary to address control deficiencies. Other than the changes discussed above related to our acquisition of Nova Furniture, there were no changes in our internal control over financial reporting during the quarter ended June 30, 2011, that have materially affected, or are reasonably likely to materially affect, our internal control over financial reporting. Since identifying the above-listed deficiencies in our internal controls, we have taken, and are taking, the actions described above to remediate the material weaknesses in our internal control over financial reporting, and we anticipate that these actions will have a material impact on our internal control over financial reporting in future periods. However, because this remediation process is still in its initial stages, we can give no assurance as to when it will be completed.